Antique China head dolls have delighted children and adults alike for years, and the passion for these antiques continues unabated. Whether you purchase high-end, museum-quality examples, or you delight in a doll which survived some dings and chips, collecting china head dolls means entering in a world of history, fashion and fairytales. What Is a China Head Doll? China head dolls are those dolls with head, neck, and shoulders (also called shoulder plates) made from china. Sometimes, the lower legs, feet, hands, and arms were also made of china. The china sections had small holes punched in them, and were sewn to doll bodies made of fabric and stuffed with horsehair, straw, sand or other materials. Dolls came in all sizes, from a few inches to nearly 36" or more; the size depended upon the china factory's ability to mold larger body sections. China dolls first began to appear in the 18th century notes the 2001 Childhood Playthings exhibit from the Shriver-Weybright Exhibition Gallery, although they were far less available than the wood, gesso, wax and papier mache dolls of the era. Many "dolls" were, in fact, figures made for creches, the Christmas manger scenes set up in churches and homes. China was imported from the East to Europe, until the secret of porcelain making was revealed, and Germany started to produce fine china in its own factories. By the first part of the 19th centuries, china head dolls were claiming their place in the home. As china manufacturing methods became more dependable, china head dolls started to fully enter the market by the 1830s according to Collectors Weekly. They had varied looks. In Europe, dolls china factories began to turn out dolls resembling the young Queen Victoria after she took the throne. European and American factories molded dolls with popular hairstyles, pretty faces and delicate hands. Many dolls represented young women and girls, although boy dolls and baby dolls were also manufactured. Are China and Porcelian Exactly the Same? China was first made in the East, where the process was secret, according to Global Times newspaper. It's called "china" because that is where the pottery originated. China is made from a mixture of clay and minerals mixed with water, molded or shaped and then baked at high temperatures. China provides the base for both porcelian and bisque/parian, as both KnowledgeNuts and the Childhood Playthings exhibit explain; the small differences are what brought about the separate names. A glaze was used to coat china, thus making the material impermeable to water; unglazed china is known as bisque or parian. Porcelain is created when china is fired at higher temperatures. Porcelain was often painted and then glazed, allowing for very detailed decorations. Unfortunately, many factories did not identify their products, since they were making parts for resale and not complete dolls. Other factories were sold and resold, changing their names and their marks, but still making dolls and doll parts. Some makers placed a doll (or child's) name on the shoulder plate, without noting the factory. KPM Meissen was among the earliest manufacturers of dolls, beginning in the late 18th century and continuing until the end of the 19th century. Famous for porcelain, their work was always hand painted, and exquisitely modeled. Although the factory marked many items with KPM and a symbol, there are also many reproductions and fakes on the market today. The Hertwig Porcelain Factory in Germany made dolls from the 1860s into the 1940s; find identifying marks like the company name or house symbols with an H or cat inside by scrolling down to the bottom of the previous link. The factory closed during the communist period of East Berlin, and its dolls are highly collectible. American companies, along with other German, French and Czech factories also produced dolls, but, as previously mentioned, many of the dolls were unmarked and little is known about the smaller companies. Collectors Weekly notes that from the 1860s until the 1930s or so, millions of china head dolls were made and sold, and are still popular in the antiques marketplace. If you know the maker of a doll, you may be able to find it on Doll Links, which lists china head and other doll manufacturers from the 19th century on. Dating a china head doll takes research and experience, although there are a couple things that can help clue you in to the date of the doll. China head dolls had painted faces and molded hair, although Biedermeier dolls, or dolls from an era in German history that overlapped with the English Regency from around 1815-1848, often required a wig. The time period became associated with this style of doll and many dealers use the term to refer to these wigged dolls from the previously mentioned dates. Hairstyles may give a hint about who the doll may represents, or when she may have been popular, but doll manufacturers might used a head mold for years, even after the hairstyle was out of date. Covered wagon hairstyles referred to the simpler, "pioneer" look of these dolls which were made from the 1840s into the 1860s. Dolly Madison hairstyles were prominent on 1870s dolls. The doll had a head full of curls, and sometimes a ribbon, which was a popular style with Dolly Madison who lived in the early 19th century. The Dolly Madison doll was popular two generations after the real Dolly was First Lady. Mary Todd Lincoln's hairstyle appeared on dolls from the 1860s onward, contemporary with her popularity. The style included a center part and ribbon, with rolls over the ears. In the 1860s, Jenny Lind dolls were made to resemble the popular singer known as the Swedish Nightingale who toured America in 1850. Her hairstyle consisted of swept back sides and center part. Hair color can also help date a doll's manufacture. China head dolls were made with black, very dark brown, and blonde hair. Red hair was not very popular: it had the reputation for being an unlucky color, so that may have deterred doll manufacturers from using it. Dolls were dressed and changed and loved by children, so many times the clothing on a doll is not original. A china head doll with original clothing (or at the very least, clothing from the doll's era) is more valuable than a doll without the correct clothing. Some doll collectors wait years before they locate accurate clothing for their china head doll. Do not remove or destroy any clothing from a china head doll, no matter how poor the condition: clothing can offer many clues to the doll's age. One category of china head doll typically came dressed in the time's proper fashion - fashion dolls. For example, a fashion doll might wear clothing made from 1860s fabric, and be dressed in a "bolero"-style straw bonnet and red leather shoes. Fashion dolls were dressed in the latest fashion, and were less a plaything than a display item. Early dolls were sent to the colonies or around England to convey to ladies the next new thing in fashion, while men got into the game as well. Some dealers specialize in doll clothing, and have lots of information about doll dresses, gowns and other items, which assist in identifying a doll's manufacturer or time period. China head dolls were sometimes sold with their own wardrobe, often a trousseau, as described in a video by Theriaults, the doll auction house. Dolls such as these often have a provenance, or history, of their ownership, which helps identify the period and style of the doll. An excellent publication for identifying (or purchasing) china head doll clothing is Antique Doll Collector Magazine, which lists dealers and resources for research. 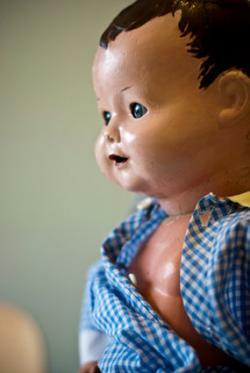 Several factors enter into what makes a china head doll rare or valuable. 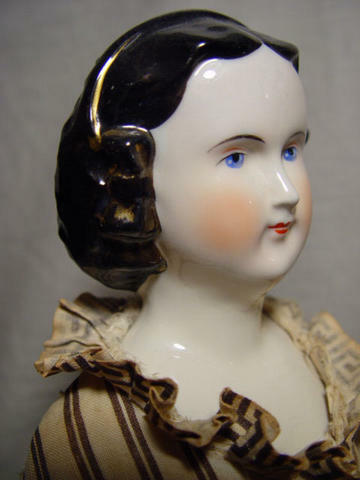 Manufacturer - KPM Meissen was one of the earliest producers of china head dolls, and their examples are rare and expensive, partly because of the KPM mark but mainly because of their artistry in details and handpainting. Condition of the head - Chipped paint, cracked china, and missing details all contribute to lowering a doll's value. Clothing - Are the clothes in good condition or even present? Are they contemporary with the doll? Body - Is the doll's body intact? Is it made from modern materials? Features - Does the doll have interesting features, unusual hair (molded or real)? Was she made to resemble a famous person, like Queen Victoria? Taken all together, a china head doll has to have a lot in place for it to command the highest prices. For example, one particularly interesting china doll was Frozen Charlotte, which was a one-piece doll of china -- head, limbs, and body. They could be very tiny (about the size of a modern penny), a few inches tall, or more rarely, 10" or more: the name came from a folk song about a girl who didn't dress warmly enough on a sleigh ride and froze to death. Rarity is difficult to define, but can mean an object which comes up for sale only only or twice every decade and has collectors willing to pay highly for it. Antique china head doll collectors are avid in their search for the best condition, the most complete clothing, and the most unique doll, driving prices up each year. Very old, rare antique dolls have sold for $5,000 and up, and include china head dolls and their wardrobes as the list from What Sells Best shows. 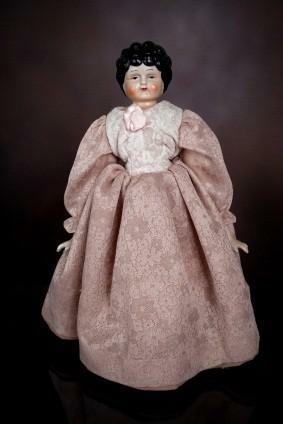 Provenance Antique Dolls has a listing of dolls that starts at $1,900 and heads to $25,000 for French examples. They are rare because of the clothing, and its condition. Male dolls are just as collectible and far less common than female dolls: a German gentlemen doll from KPM Meissen sold for more than $18,000, much of that due to the maker, the condition, and the subject. 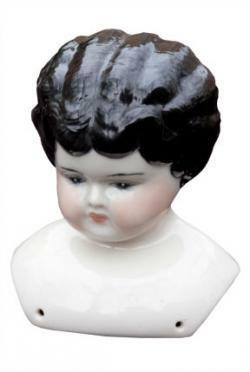 China head dolls still show up in antiques shops and at flea markets; keep an eye out for modern reproductions which are thick looking, with little detail. However, there are places where you can purchase fine china head dolls online. Prices may range from $100 and way, way up. 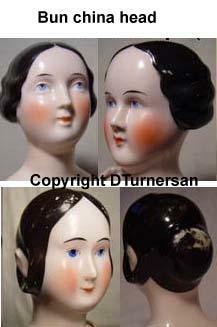 The antiques website Ruby Lane has a number of doll dealers who offer china head dolls regularly. Theriaults Auctions is world-renowned for their doll sales. 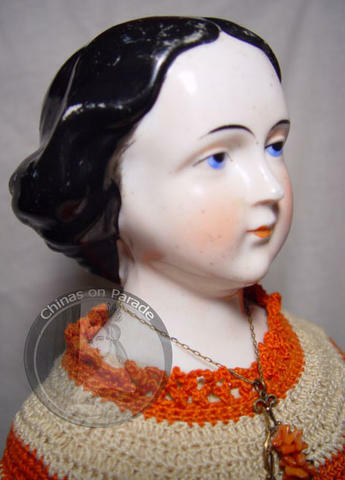 The Doll Works lists many china head dolls, as well as other antique dolls. Antique Child offers an ever-changing selection. China head dolls have been adored for more than two centuries, and there is no reason to believe that they will ever lose their appeal to collectors. Assembling a collection can be expensive, but the reward is knowing you are helping keep the traditions of playtime and make-believe alive and well.